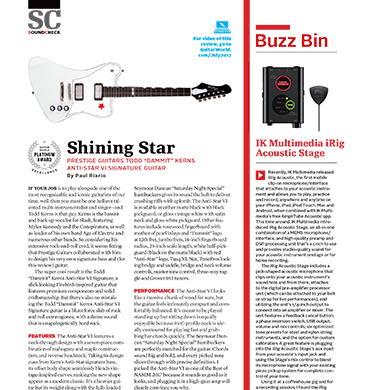 Shining Star - Anti-star VI Guitar World Review - Prestige Guitars Ltd. IF YOUR JOB is to play alongside one of the most recognizable and iconic guitarists of our time, well then you must be one helluva talented multi-instrumentalist and singer—and Todd Kerns is that guy. Kerns is the bassist and back up vocalist for Slash, featuring Myles Kennedy and the Conspirators, as well as leader of his own band Age of Electric and numerous other bands. So considering his extensive rock-and-roll cred, it seems fitting that Prestige Guitars collaborated with him to design his very own signature bass and (for this review) guitar. The super cool result is the Todd “Dammit” Kerns Anti-Star VI Signature, a slick looking Firebird-inspired guitar that features premium components and solid craftsmanship. But there’s also no mistaking the Todd “Dammit” Kerns Anti-Star VI Signature guitar is a blunt force slab of rock and roll extravagance, with a dense sound that is unapologetically hard rock. The Anti-Star VI features a neck-through design with a seven-piece combination of mahogany and maple construction, and reverse headstock. Taking its design cues from Kern’s Anti-Star signature bass, its offset body shape seamlessly blends vintage-inspired curves, making the new shape appear as a modern classic. It’s a heavier guitar but its weight along with the fully loaded Seymour Duncan “Saturday Night Special” humbuckers gives its sound the heft to deliver crushing riffs with aplomb. The Anti-Star VI is available in either matte black with black pickguard, or gloss vintage white with satin neck and gloss white pickguard. Other features include rosewood fingerboard with mother of pearl inlays and “Dammit” logo at 12th fret, jumbo frets, 14-inch fingerboard radius, 25-inch scale length, white half-pickguard (black on the matte black) with red “Anti-Star” logo, Tusq XL Nut, TonePros locking bridge and saddle, bridge and neck volume controls, master tone control, three-way toggle and Grover 18:1 tuners. The Anti-Star VI looks like a massive chunk of wood for sure, but the guitar feels intimately compact and comfortably balanced. It’s meant to be played standing up but sitting down is equally enjoyable because its C-profile neck is ideally contoured for playing fast and grabbing bar chords quickly. The Seymour Duncan “Saturday Night Special” humbuckers are perfectly matched for the guitar. Chords sound big and bold, and every picked note slices through with precise definition. I picked the Anti-Star VI as one of the Best of NAMM 2017 because it sounds as good as it looks, and plugging it in a high-gain amp will clearly convince you why.